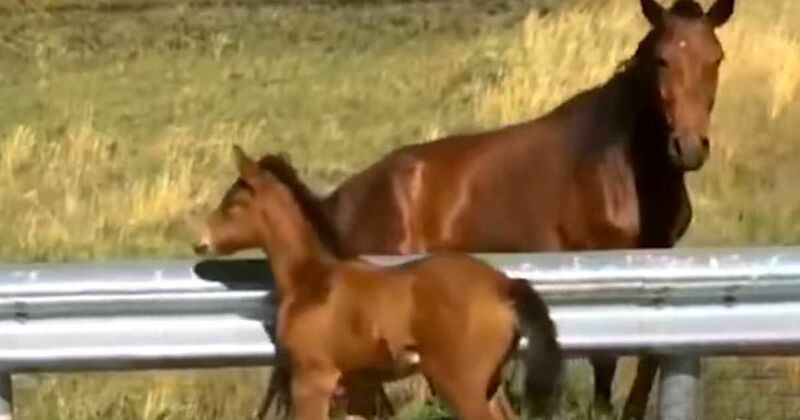 Imagine driving on a highway and coming across a wild foal stranded in the middle of the road. That's just what happened to the good citizen in this video, but thanks to his quick thinking, this story has a happy ending. It's unclear how the situation came about, but somehow the foal found itself in the middle of two highway lanes. The foal's herd, including its mother, was on one side of the metal guardrail, but the young horse wasn't tall enough to jump over it. The foal was clearly distressed, wandering around the road and coming dangerously close to the front of the good citizen's car. Luckily for the foal, this good citizen realized that something was amiss and that the foal needed help. Still, approaching and getting a grip on the foal would be a challenge. Foals bond strongly to their mothers just hours after birth. According to Heather Smith Thomas of TheHorse.com, "To survive in the wild, a foal has to learn who his mother is, quickly get up and nurse, follow his dam, and run alongside her to flee from danger. Prey species like horses and deer attach and bond with what they see right after birth (the mother) and later instinctively flee from anything unfamiliar." The foal's instinct to flee the unknown caused it to try its best to evade this good citizen. With some determination, the good citizen got a hold of the foal and managed to lift it over the metal barrier as the foal's dam eagerly waited nearby. It's worth knowing that the foal didn't kick or struggle while being lifted up. The fact that its dam was nearby may have calmed it, or perhaps the foal sensed that it was being returned to its family. In a world where wild horses are so often seen as nuisances, it's refreshing to see someone so dedicated to doing the right thing. The foal was no doubt thrilled to be reunited with its herd, and who knows how this story would have turned out if this good citizen hadn't stepped in?